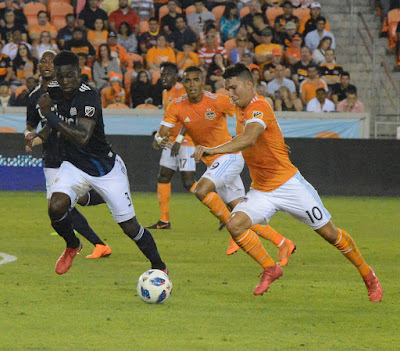 HOUSTON, TEXAS (March 31, 2018) For the 24th time in program history, the Houston Dynamo and the New England Revolution faced off in a 90-minute contest with the Revolution taking a 2-0 win at BBVA Compass Stadium in Houston. 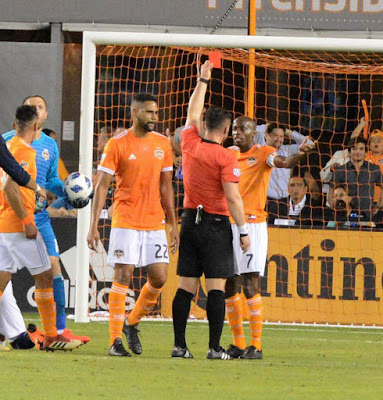 The Dynamo lost dropped them to 1-2-1 (4 points) for the season and takes their all-time record against their Eastern Conference rival to 5-12-7. In the 15th minute, New England took the early lead on a counter attack shot by forward Teal Bunbury. He took a pass from forward Cristian Penilla, who was driving down the right side and aptly sent the ball to the Canadian for the score. It was the first goal of the season for Bunbury and the third assist for Penilla. In the 35th minute, DaMarcus Beasley (shown left) picked up a red card for aggressive play; taking down Penilla at the top of the box, forcing the Houston to play with 10 men and without the services of their captain for the remainder of the match. It was first exclusion of his career, and as a result, Houston will be without Beasley in their April 14 match in San Jose. The second half saw the Dynamo aggressively attacking the Revolution; with Alberth Elis breaking for the goal in the 63rd minute. His shot was turned away by goalkeeper Matt Turnerto keep the New England lead at one. New England responded nine minutes later with a tight-angle shot from the right post by Penilla for the second goal of the game. Dynamo head coach Wilber Camrera discussed with the press, after the game, the adjustment that were made a halftime. "We just decided to keep a block of the back four and two defensive midfielders. We sacrificed (FW) Andrew Wenger. He went from the wing to the left back and he did a good job. Then we keep the two midfielders, defensive midfielders, and we tried to leave (FW) Alberth (Elis) and (FW) Mauro (Manotas) a little bit more with freedom to look for opportunities. I told them we are going to have one or two opportunities and when we have one or two opportunities, we need to put that ball in the net. We had two clear opportunities, but we couldn’t do it. They scored a good goal because they have very good, talented players. Even though we tried to put some fresh legs up front, we could not score today. We need to regroup. We need to give a little bit of a day off and come back with a good mentality to try to overcome this situation that has happened twice this year for us. We feel really awkward coming home and losing two times in the first three games of the season. This is something that we have to face now, and we need to fix it." Houston goalkeeper Chris Seitz made his 100th career start in an MLS regular season game while Beasley made his 176th career start in MLS regular season play.